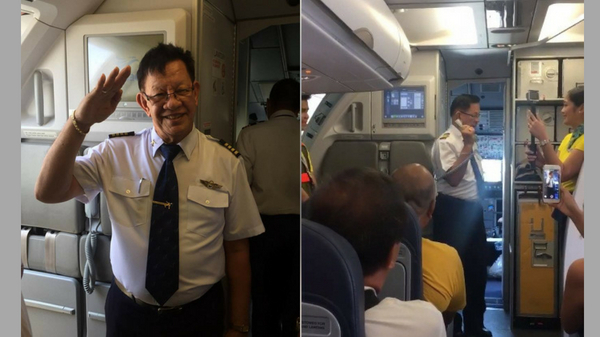 MANILA, Philippines – A pilot became emotional as he shared a short tearful message to the passengers of his last flight in time for his retirement. Amidst all the fiasco that happened at the Ninoy Aquino International Airport (NAIA) as flights were cancelled, rerouted or delayed these past few days, a heartwarming video of a delayed flight have kept the netizens abuzz. The tearful captain tried to hold back his tears as he expressed his plans for his retirement. He said, “Thank you. Tomorrow, I will be retired. I promise to spend my remaining years serving the Lord. You know I missed a lot of Sundays...Godbless everyone." Capt. Irizari went on to thank the crew and his family who joined him on the memorable flight. The passengers were clearly touched and appreciated the gesture. Capt. Irizari received cheers and applause from the passengers. Even on Facebook, some passengers continued to share their appreciation for the teary-eyed pilot. Another passenger, Enolueno T. Barona shared a short message for Capt. Irizari saying, “It's an honor to be part of your journey Captain! We also enjoyed the water salute! Your family's presence in the plane brought joy and hope. It reminds us that no matter what we do and where we are, there is always a place called home."